Drug Alcohol Treatment Center Orange County - Blog: Changing The Legal Drinking Age? Changing The Legal Drinking Age? A proposed ballot initiative decreasing the legal drinking age from 21 to 18 has been approved to begin gathering signatures, and if enough people sign, it could mean that Californians will vote on it this November, KTLA5 reports. The measure was proposed by Terrance Lynn, a tech-company chief financial officer. Lynn has until April 2016 to collect 365,880 signatures. Naturally, Mothers Against Drunk Driving (MADD) has a few things to say about the proposal, as they were the primary organization which lobbied for increasing the legal age of drinking to 21. The organization contends that more than 25,000 lives have been saved since the legal age was raised, according to the article. 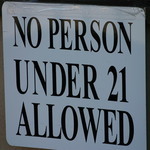 “When states had lower legal drinking ages in the U.S., the underage drinking problem was worse. For example, before the 21 minimum legal drinking age was implemented by all states, underage drunk drivers were involved in over twice as many fatal traffic crashes as today,” stated MADD. If the California were to revert to 18 from 21 years old, it would present a huge fiscal impact on the state, the article reports. The catalyst for all 50 states to approve raising the legal age of drinking to 21 was that the Federal government threatened to withhold highway funding to any state that failed to get on board. Changing the legal age in California would result in $200 million loss in federal highway funds, according to a fiscal impact on state and local governments from the Legislative Analyst and Director of Finance. We would love to hear your thoughts on changing the legal age back to 18.